This is a very large Ceraurus trilobite. It is a beautiful Gabriceraurus dentatus from Ontario, Canada. We recently acquired this incredible specimen from the Eugene Thomas Collection. First, the bug is huge - well over 3 inches long! The cool trilobite is wonderfully articulated and almost perfectly prone. The thick shell exoskeleton is amazingly well-preserved, and the detail is quite nice. The trilobite is beautifully showcased on the rectangular block of sculpted limestone. 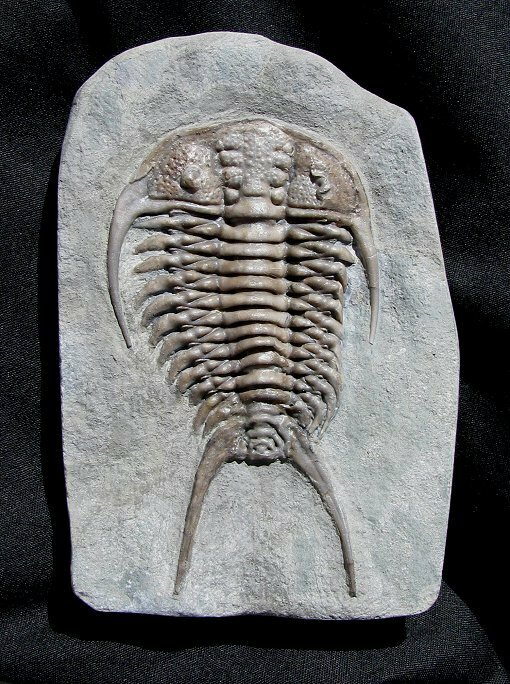 This is one of the most impressive trilobites found in Canada. It is a super display piece - a wonderful example of this large, collectible type of Ceraurus.